Katie Archibald ranks her Commonwealth Games bronze medal as the best achievement of a glittering year. 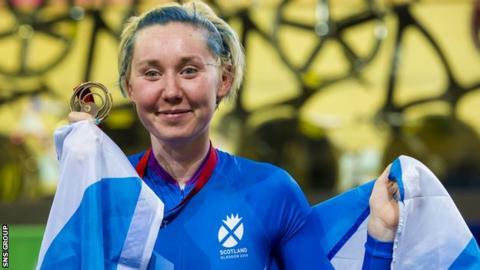 The 20-year-old Scot won European team pursuit gold on Friday, adding to her world team pursuit gold and national individual pursuit title. But it was a third place finish in the 25km points race in Glasgow that brought most satisfaction. "That's the biggest," she told BBC Scotland. "It was something I was looking at for a long time." During her home Games, Archibald, from Milngavie, rode in three track events at the Sir Chris Hoy Velodrome as well as the road race and time trial. "When I first made the leap into top level track cycling, it was the Commonwealth Games that inspired me to get up and train in the morning," she explained. "With it being on the horizon for so long, to get the medal as a pay-off was fantastic." Archibald says she is "feeling good" ahead Sunday's individual pursuit at the European Track Championships in Guadeloupe, the first chance to score Olympic qualification points for Rio 2016. "It's a heavy surface but I've done a lot of road work and it's maybe more relatable to that, so I'll give it a good crack," she added. Archibald, along with Elinor Barker, Joanna Rowsell and Laura Trott, defeated the Russian team by nearly seven seconds in the team event final. "It's very different to the track we ride on in Manchester," she continued. "It's concrete and very bumpy, so you need full concentration. "It's also very hot, the kind of heat that gets into your head."